The way I see it, there are two basic methods of attacking the problem of getting around San Francisco on public transit: chance and control. Chance, I believe, speaks for itself. Control is what the rest of us attempt in neurotic fashion, day in, day out. We use NextBus, iPhones, BlackBerrys, crystal balls, bat droppings … whatever it will take to inform us when the freakin’ bus will be there. It’s a crowded field, to be sure. But what if, just what if, some augur of reliability emerged from the crop to solve [most of] your woes? Here’s a first look at a series of apps that we’ll review here at Muni Diaries. Today, we’ll look at iCommute. The first thing I noticed about iCommute was its groupings of routes (1-10, 11-20, etc.) on the right side of a list of all the routes, much the way iPhone apps like Contacts and iPod use “index-scrolling” (my term) for quick access to far-off parts of your list. It was then that I realized iCommute might just turn out to be a must-have app. Like many GPS-enabled apps, iCommute asks your permission to use your location. Yes, please. Every subsequent use sensibly uses your location without being prompted. After you drill down to the route you want, it automatically highlights the nearest stop on that line, and tells you how far away it is. After selecting your stop, predictions for the next bus are loaded (and they continually update as necessary), as are “other buses at this stop” and a Google map. Should you need directions (despite the fact that the map tells you where you are and where the stop is), you can press a button to be hauled over to the Google Maps app. I’m not sure why you’d want to leave iCommute, but there you have it. Another great feature, as well as something else that makes iCommute so much better than NextBus’s decent mobile site, is the ability to add your “favorite” routes and stops. This makes accessing information about those routes and stops as easy as a click or two. The program’s inherent functions (meaning those that do not require network access) are blazingly fast — testament to solid coding on the app developers’ part. Like many apps, iCommute will only work as well as AT&T allows it to. And because it’s caught in a vicious triangle between Ma Bell and Muni, the jeopardy is doubled (NextBus is perhaps a third villain in the drama, but it, like iCommute, typically works only as well as Muni does). Then again, iCommute is a lot like Muni, though through no fault of its own: When it works, it’s so useful and you love it. It only fails when AT&T or Muni do. Available on iTunes for $2.99, I think it’s a pretty good deal. FYI, this is part of the iPhone OS. All any app does is ask the OS for your location. The OS then asks you if that’s ok, and then sends the location data or nothing back to the app, based on your response. If you’ve already authorized a certain app, the OS is smart enough to stop asking, and it just goes ahead and hands over location data. That’s why the process looks exactly the same for every app. iCommute looks nice, but, for the occasional Muni trip outside of my familiar commute lines, I’ve been using the built-in Google Maps app. Just dial up some directions as though you were driving, and tap the little bus tab at the top of the directions screen. It doesn’t have NextBus times built in, but I’ve got their mobile site bookmarked in Safari, so that’s only a few taps away. As far as saving favorite stops with this method, it’s a simple Safari bookmark. I’ve got my morning and evening stops saved this way. One thing I would like to see using this app is for the ability to input a destination like you can do with google maps app as stated above. If it could then tell me the next bus arrival time that would be ideal. Hey guys, thanks for the feedback. I hear what you’re saying about Google Maps. I use that app for so many things, and love it. I’m really looking forward to the next upgrade to iPhone software, due this summer. In it, apps like iCommute would have the ability to embed Google Maps that are scalable in the app itself, without having to load the separate Google Maps app. @Rick: One feature I really like about iCommute, and feel helps it compete with if not exceed Google, is its ability to load route and stop information quickly. Because the routes and stops are native to the app, and not depending upon network connections, getting to the level of stop/next bus information is a lot quicker. For now, seeing as how a lot of this technology is still relatively new, using a couple of apps (iCommute in concert with, say, Google Maps) seems the way to go. Perhaps I should’ve clarified that with this version of iCommute, AppTight is off to a great start. I use this everyday and it rocks! 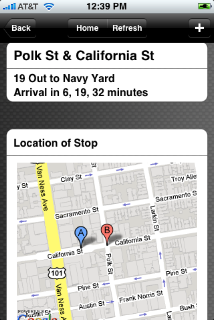 I’ve got my favorite stops all queued up so that when I need to know when my ride is here, it’s only a few taps away. Thanks AppTight! Jeff, have you used Routesy? I’m still a huge proponent of the NextBus texting service, which I reviewed several months ago. I use it daily, and I don’t have to wait for slow load times from my Android (aka The G Phone). But I’ll give some apps a whirl just to veer from the same old. Routsey is slow and outdated. Ah, so I should keep the $2.99 on that one? Routesey was the first app I actually paid money for. I’m still using it even though I got iCommute too. I find google maps is good for planning but if you miss your bus or it is mysteriously late, it is awkward and slow to dynamically re-route. After a while you know which routes are near your starting place and how fast you can walk to stops so something like Routesey or iCommute works better. I find Routesey works better for me if I’m somewhere away from my usual haunts but iCommute is better if I’m at a usual location since I can “favorite” those stops. Unfortunately, both Routesey and iCommute crash on me relatively frequently (like 1/10 times I run it). Not sure what’s going on there. And iCommute only seems marginally faster than Routesey to me. I’ve been using both lately (been taking muni a lot more frequently since I wrenched a knee and got a translink card) and haven’t really settled on either. So iCommute somehow mashes up NextBus data? @Andy yes, i’m pretty sure it’s NextBus predictions that iCommute loads once you reach the screen with your route and stop. anyone know differently?